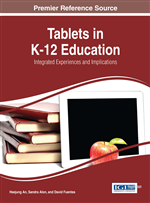 As tablet technology becomes more widely available for preschoolers at home and at school, it is necessary to examine the effects of these tools in early childhood education classrooms. This chapter focuses on the use of iPad electronic books (e-books) and their effects on preschoolers' understanding of vocabulary and story comprehension as well as engagement during reading activities in an urban New Jersey school. The results of this study highlight the positive ways in which iPad e-books can be used to support literacy in preschool classrooms. This chapter also includes recommendations for preschool teachers who may be considering using e-books in their classrooms. As the use of technology becomes more prevalent in young children’s lives, educational organizations have called for the better integration of digital tools in education. For instance, the National Association for the Education of Young Children asserts in a joint position statement with the Fred Rogers Center for Early Learning and Children’s Media on Technology and Interactive Media as Tools in Early Childhood Programs Serving Children from Birth through Age 8, that educators should be positioned to improve program quality by leveraging the potential of digital tools for the benefit of every child (NAEYC, 2012). NAEYC (2012) further states that young children need opportunities to develop the early “technology-handling” skills associated with early digital literacy that have traditionally been akin to the “book-handling” skills associated with early literacy development. Within the field of childhood literacy, digital technology often changes the ways in which young children learn to read, as new devices require “new literacies to effectively exploit their potentials” (Leu, Kinzer, & Coiro, 2004, p.1570). The interface and functions that these new tools afford may have a greater impact on the way learners read, as well as their attitudes toward a particular book or text. In fact, a number of studies have shown the positive impact of digital texts, such as electronic books, in enhancing the reading motivation and engagement of readers (e.g., Larson, 2010; Moody, 2010; Rhodes & Milby, 2007; Thoermer & Williams, 2011). Using iPads, in particular, as instructional tools, has been noted to support the teaching of emergent literacy in early childhood classrooms (Beschorner & Hutchinson, 2013). That said, most studies conducted in this area are anecdotal or practice based, with a focus on describing how to use iPads, or sharing instructional best practices. Since iPad tablets are equipped with a variety of interactive multimedia applications, it is imperative that more systematic research regarding their effects on young children be conducted. To that end, the purpose of this study was to examine the effects of interactive multimedia books with iPads, in an urban public preschool setting consisting of 4 and 5 year old students. The focus of this study was on the learners’ vocabulary acquisition and comprehension skills, as well as their level of engagement during small group activities.